You are here: Home / Anti Graffiti Solutions. Superior Paint and Powder Coating provide anti-graffiti powder coating solutions for graffiti damage on architectural aluminium. Graffiti is a problem in towns, cities and urban areas all over the modern world. Disused buildings, public transport, recreational areas and other places all suffer from graffiti and other damage. 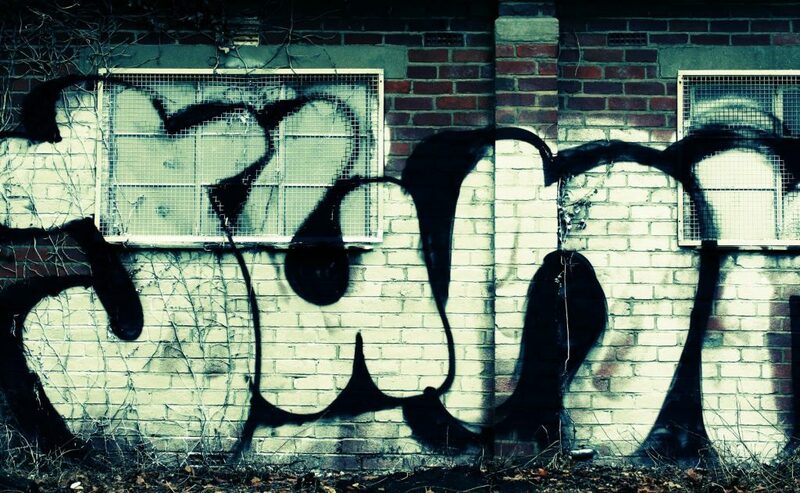 Local authorities and building owners have for many years suffered from the vandalism of Graffiti whether it is large murals, slogans or images, with marker pens, paints or spray cans. Graffiti is vandalism resulting in unattractive living and workspaces as well as causing frustration and the public and building owners and expensive to remove. Often an area cleaned of graffiti is often and quickly vandalised again. Superior Paint and Powder coating are able to offer assistance in minimising graffiti with anti-graffiti powder coating solutions. Our anti-graffiti coatings come specially formulated, achieving a surface finish resistant to paint chemicals and solvents. We offer an anti-graffiti clear coat as well as a specialist graffiti remover and cleaner, enabling the removal of most graffiti. Correctly applied, this treatment suits building and facility owners such as transport authorities, local councils, shopping centres and other public buildings. As a result, we provide protective paints for anywhere prone to the vandalism. Furthermore, we help reduce costs and inconvenience with graffiti removal. Where clean environments are essential such as hospital areas, laboratories, childcare spaces, treatment plants and any area requiring specific protection against bacteria and microbes Superior Paint and Powder Coating can offer solutions. Our anti-bacterial paint solutions come specially formulated to fight and protect against the migration or growth of bacteria. As a result, you benefit from anti-bacterial powder coating available in our full range of colours. Also available with textured surfaces, therefore protecting almost any surface from the growth and spread of bacteria. A full range of colours and textures is available and below we list just some of the products or areas that can benefit from Anti Bacterial Paint Solutions. Facilities Managers. Suitable for handrails, push plates, door handles, soap dispensers, bannister rails and toilet/washroom equipment. Food Environments such as serving trays, metal salad bars and buffet areas. Refrigeration and coolers, serving counters, refrigerated food display areas and serving bowls. Home Appliances such as domestic white goods, refuse bins, food processing equipment. Hospitals and Medical facilities and equipment such as sterilisation equipment, beds and examination tables. Additionally consumables including commodes, bedpans or other hospital equipment. Contact us for more information on anti-graffiti and anti-bacterial powder coatings. Use our contact form to get in touch or contact us to ask any questions about our specialist powder coated colours and surfaces.